Is your cannabis making you feel sleepy? Have you ever found yourself stuck on the couch after a little too much cannabis? What about yawning, drifting off, or downright ready for bed? As it turns out, chemical compounds in the herb may be responsible. Cannabis is a complex plant that produces at least 545 different chemical constituents. Many of these compounds are pharmacologically active and each individual cannabis plant produces its own unique combination. Some of these chemicals can make you drowsy by themselves. Yet, certain combinations might be more powerful than others. Here’s why some cannabis makes you tired. 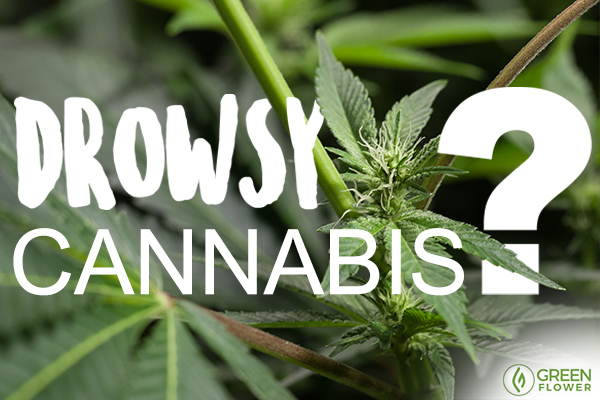 Why does cannabis make you drowsy? Terpenes are the aroma molecules that give cannabis flowers their distinct scent. These molecules are also thought to have medicinal benefits. Theorists suggest that terpenes and cannabinoids, the active components in the plant, work together to provide synergistic effects inside the body. Some of these terpenes may heighten the sedative qualities of the cannabis plant. One such terpene is myrcene, which is the compound that provides a musky, mango aroma to some strains. A 2011 review published in the British Journal of Pharmacology cites evidence that myrcene is a muscle relaxant and hypnotic. These effects may be amplified when used in combination with tetrahydrocannabinol (THC). The same review has found that linalool, a cannabis terpene molecule associated with lavender, also has sedative effects. When combined with cannabidiol (CBD), the compounds are thought to have an amplified anticonvulsant and anxiety-relieving effects. In fact, lavender oil capsules, which contain between 25 to 45 percent linalool, have been successful in easing anxiety in human clinical trials. Nutraceuticals made with lavender oil were found to be just as effective as lorazepam (Ativan), a drug used to treat generalized anxiety disorder. Another sedative terpene is nerolidol, which is found in oranges. When combined with THC and CBN, this compound is expected to have a drowsy effect. Based on this data, a cannabis strain featuring significant levels of all three of these terpenes would be a very drowsy selection. A strain like this may also make for a successful muscle relaxant and anti-insomnia tool. Cannabis fatigue can be an unwanted effect for a lot of people. Terpenes can contribute to the heavy bodied sedation in some cannabis strains. Yet, THC on its own is thought to have an impact on sleep. A review from 2008 has found that oral THC treatment increased the amount of phase 4 sleep. Phase 4 sleep is the latter phase of slow-wave sleep. During this stage, human growth hormone is released, repairing muscles and damage from the day. This is thought to be a restorative phase of sleep and it plays a role in memory consolidation. The same review found that, in general, cannabis seems to cause a rapid onset of sleep. However, the cannabinoid also reduces REM sleep. Rapid Eye Movement (REM) sleep is the final stage in the sleep cycle. Dreams occur during this sleep phase and REM cycles are typically longer closer to morning. During REM, early research suggests that the brain consolidates emotionally charged memories. Since THC is currently thought to reduce REM sleep, this quality may be of use for those who suffer nightmares. Though, the health implications of THC’s effect on sleep have yet to be fully identified. Believe it or not, stale cannabis might make you more likely to feel tired. Old cannabis flowers contain more cannabinol (CBN), which is predominantly found in dried, aged buds and leaf material. CBN is a breakdown product of THC. A 2011 review suggests that CBN does not produce much of a potent effect when used on its own, but it is thought to amplify the sedative effects of THC. The longer a cannabis flower is cured, the more likely it is to express CBN. An aged cannabis bud will therefore likely be more sedative than one with a fast cure time. There is some debate on whether or not indicas and sativas should be differentiated by their effects. Yet, generally speaking, strains classified as indicas are thought to provide more sedative effects. Commonly recommended for the nighttime, indica strains tend to produce more myrcene, which is thought to contribute to their heavy-bodied and drowsy effects. Strains that full under the Kush lineage are considered sedative in popular culture. How does cannabis affect sleep overall? The effects of cannabis on sleep are complicated. While some research suggests that cannabis improves sleep, other research suggests that it really all depends on the chemicals on a given sample. A 2004 study found that THC alone and THC combined with CBD had different effects on sleeping patterns. The study treated 8 human patients (aged 21 to 34) with either THC (15mg) alone or THC plus CBD (5 and 15mg each). Researchers found that THC alone had no effect on nocturnal sleep, but it did help the participants fall asleep faster. However, THC alone also increased drowsiness and had a negative effect on memory the next day. When combined with CBD, however, the cannabinoids seemed to have an energizing effect. As if CBD canceled out some of the sedation of THC. The combination also decreased phase III sleep, which is the early stage of deep sleep. While this research is early, one can speculate that a strain with a 1:1 ratio of THC to CBD will be significantly more energizing than a THC-dominant strain. There is far from enough science on this subject. Different cannabinoid and terpenoid concentrations may have strikingly different effects on sleep. Strains higher in terpenes like myrcene, linalool, and nerolidol may enhance the sedative, drowsy, or hypnotic effects of the herb. If you want to know whether or not a strain is really going to make you drowsy, look at the test results so you can be aware of terpene and cannabinoid profiles and how they affect you. If fatigue is an issue, you might also try a 48-hour tolerance break, so you can resume with smaller doses. Tired of drowsiness and other cannabis side effects? Does cannabis make you feel sleepy?